The Santa Barbara Metropolitan Transit District plans to roll out a real-time app for bus riders and replace 14 of its electric buses, moves that are all part of a grand rebranding effort to help increase ridership on the public transit system. The first vehicles, which cost about $388,000 each, should arrive in August, and the rest will trickle in over the next few months. The new electric buses will be longer, 30 feet instead of 22 feet. The buses were built in 1998. The new buses will be accompanied by a real-time app so riders can find out where their bus is and how long they have to wait. The buses also have new fare boxes outfitted with smart card technology, which will allow MTD to phase in a wider network of fare-paying formats. And the vehicles come with automated wheelchair ramps, which eliminate the need for the driver to stop the bus, get out and open the ramp by hand. The new buses are the first wave of a larger MTD undertaking, when the agency will replace another 14 40-foot electric buses over the next couple of years, thanks to a $5.6 million grant. The electric buses are all currently on the assembly line at their manufacturing plant in Lancaster. The first one or two buses, when delivered, will be used for training for drivers and mechanics, prior to going out into service, Blackerby said. “As we accept the vehicles and more arrive, they will begin to integrate with the existing shuttle fleet,” she said. “Once all that is worked out, the old shuttles will phase out and be taken out of service. MTD is also in the middle of a rebranding, which will include a new logo and color scheme. The replacement effort comes at a time of major ridership declines. 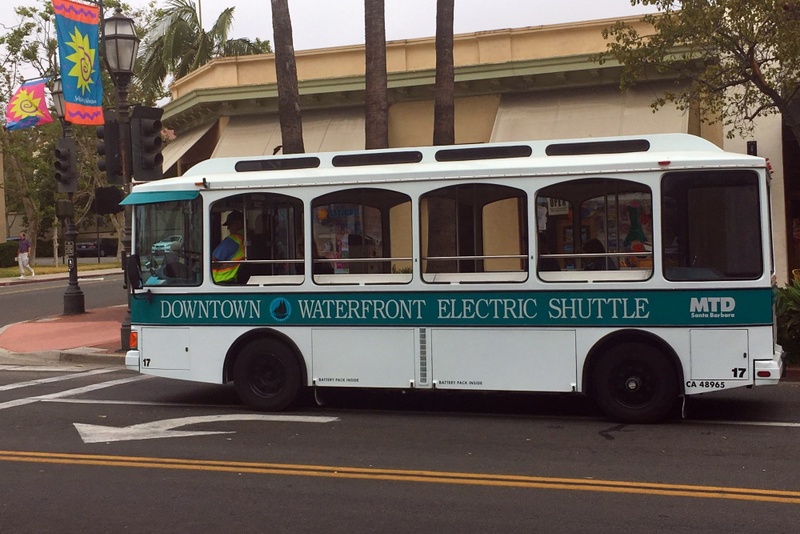 Ridership on Santa Barbara’s Downtown-Waterfront Electric Shuttle has dropped significantly in the last year, and is nearly 10,000 passengers lower than a decade ago. The Transit District, which operates bus service between Carpinteria and Winchester Canyon in western Goleta, saw monthly ridership peak in June 2007, with 63,083 passengers, and it has been steadily declining since 2013. Shuttle ridership was at 27,752 passengers in March 2016, which fell to 24,179 passengers in March of this year. MTD attributes the drop to construction, which slows down travel times, a flattening of gas prices and an overall drop in ridership nationally. The agency has seen a ridership increase on routes from UC Santa Barbara to Santa Barbara City College and downtown Santa Barbara. Blackerby said she expects ridership to increase as a whole.